CUA senior Jay Howard became just the third player in men’s basketball program history, and the twenty-second in DMV collegiate history, to score 2,000 points in his career. This historic achievement came on a night where Howard posted a career-high 36 points, but it was not enough for the Catholic University team to upset Drew. Drew, who sits at the top of the Landmark table, outlasted CUA 76-75 in the Saturday, February 3rd tilt. Catholic’s record stood at 12-8 (6-3 Conference) before entering the matchup and sitting on the on the playoff bubble in 4th place. Howard entered the night only 30 points shy of the mark and hit the milestone with only 7:32 to play on an and-one to bring CUA within 3, 66-63. This kickstarted a 9-3 run to tie the game at 69-all on a layup from point guard Andre Mitchell. Catholic managed to tie the game twice more, but Drew had an answer every time Catholic scored. Mitchell tied the game at 73-all on two made free throws, but Drew hit a late 3-pointer to take the final lead. Howard tried to keep his team in the game with a lay up to take the Cards within one with 44 seconds left. On top of leading all scorers in the game, Howard played all 40-minutes for the Birds all while shooting 64% from the field. The forward also went 8-10 from the charity stripe with 9 boards and only 2 turnovers. Center Riley Hayes led the game with 12 boards while posting 8 points, and Mitchell posted 10 points with 3 assists and 2 boards. Sharpshooter Jimmy Golaszewski had a quieter night as he only went 3-11 from the field, posting a 9/8/1 stat line. Sophomore guard Brandon Easton came in clutch for CUA with a steal with only 17 seconds on the clock to give his team one more chance for the victory. Catholic managed to get one last three pointer off, which bounced off the rim as time expired. 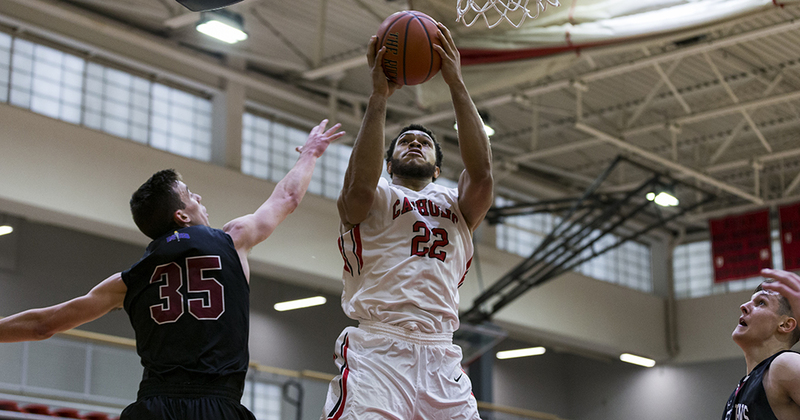 CUA returned to action on Thursday, February 8th as they squared off against Susquehanna in the DuFour Center. The team dropped their second straight game as they lost to the River Hawks, 75-71. Mitchell and Easton were the leading scorers in the game with 16 points each. The loss drops Catholic out of the coveted top four in the Landmark Conference, one game behind reigning conference champions Scranton. The next tilt for Cardinals will be crucial if they want to keep their playoff dreams alive, as they face-off against the Royals of Scranton. A victory will give CUA a 2-0 advantage in the season series, after they won handily 76-52 at home in late January. They will be traveling to Scranton this time, however, and bring a .500 road record with them. With a Cardinals victory, both teams will be 7-5 in conference play, with Catholic owning the head-to-head tie breaker.